1. What is Woodview Family Doctor’s Practice Privacy Statement ? Opening letters from hospitals and consultants. These letters are scanned into the patient electronic record. Checking for a patient if a hospital or consultant letter is back or if a laboratory or radiology result is back, in order to schedule a consultation with the GP. Sending and receiving information via Healthmail, which is a secure clinical email. It is usual for GPs and Practice Nurses to discuss patient case histories as part of their continuing medical education or for the purpose of training GPs and/or medical students. In these situations the identity of the patient concerned will not be revealed. In other situations ,however, it may be beneficial for other doctors within the practice to be aware of patients with particular conditions. In such cases this practice would only communicate the information necessary to provide the highest level of care to the patient. Our practice is involved in the training of GPs and is attached to a General Practice Training Programme. Our practice is a training site for UCC Medical Students. As part of this programme GP Registrars and Medical Students will work in the practice, and may be involved in your care. On occasion we have other Health Care Professionals (student nurses, paramedics, army defence force medical personnel) on clinical placements. You have the right of access to all the personal information held about you by this practice. You are welcome to see your records. Please make a formal written access request to the practice and we are happy to provide a copy of your medical records to you, within thirty days. 2. How can a Patient give Feedback ? 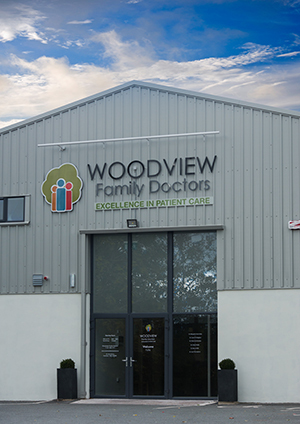 Woodview Family Doctors are committed to providing excellence in patient care. To continually enhance the service we provide, we need feedback from our patients. Your constructive feedback, both positive and negative is essential to help us identify areas where improvement may be possible. We have a “comments & suggestions” box in our foyer. In the event of a more serious complaint, please bring this to the attention of either your Doctor, or Michelle, our Practice Manager. Confidentiality and impartiality will be assured. We will endeavour to resolve matters satisfactorily.